I’ve made so many pumpkin recipes over the years between my blog and Cooking With Pumpkin. 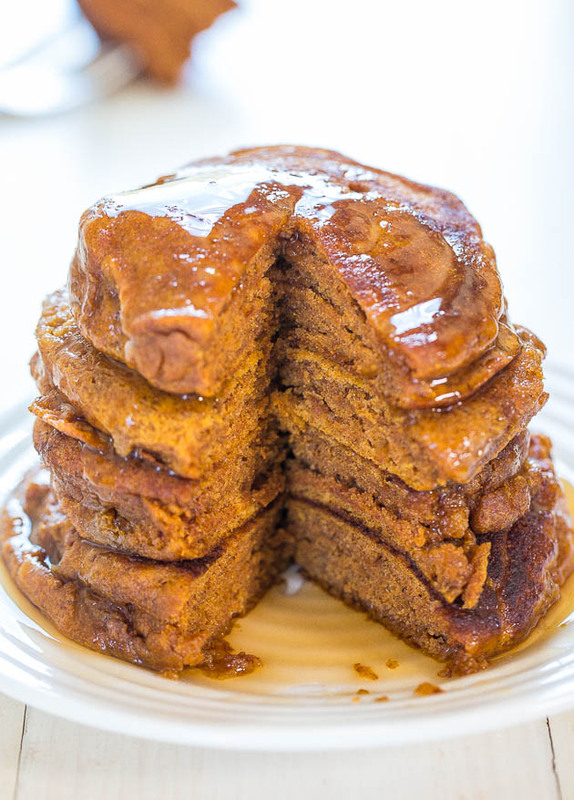 But I’ve never shared a recipe for pumpkin pancakes on my blog. Time to change that. 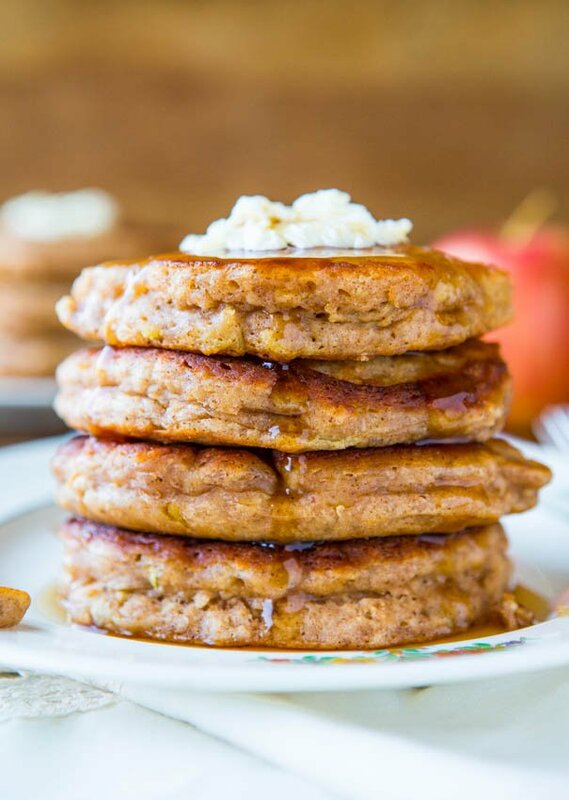 The pancakes are soft, fluffy, and are packed with pumpkin and the flavors of fall. They’re pleasantly spiced with cinnamon, pumpkin pie spice, and nutmeg. Warming spices and pumpkin go hand in hand. I use a fairly heavy hand with the spices because bland pumpkin recipes just don’t cut it. The pancakes are easy and follow standard pancake-making protocol. A bowl of dry ingredients, a bowl of wet, fold the wet into dry, and fry them up. The milk is Silk Unsweetened Vanilla Almond Milk and I love it. It only has 30-calorie per 8 ounces, tastes great, and if I need a milk for baking, vegan or otherwise, it’s what I use most often. I recently used it inDairy-Free Soft and Fluffy Blueberry Pancakes, Soft Vegan Pumpkin Cake, Soft and Fluffy Strawberry Banana Cake, Thick and Fudgy Peanut Butter Smoothies, Vegan Chunky Apple Cinnamon Muffins, Fluffy Vegan Coconut Oil Banana Muffins, 50-Calorie Copycat Skinny Caramel Frappuccinos, Honey Cornbread Muffins and more. I ‘fried’ them with non-stick cooking spray. No butter pools or puddles of oil needed. Pancakes are like sponges, just soaking in all those unnecessary fat grams and becoming dense and heavy. For my dense, heavy, and unnecessary fat grams, I’d prefer them in the form of these, but not breakfast. Now that fall is creeping up, pumpkin pancakes are a perfect comfort food for chilly mornings when a cold smoothie doesn’t sound appealing. They’re definitely worth getting out of bed for. The pancakes are soft, fluffy, and are packed with pumpkin and the flavors of fall. They’re pleasantly spiced with cinnamon, pumpkin pie spice, and nutmeg. Warming spices and pumpkin go hand in hand. I use a fairly heavy hand with the spices, but season to taste. 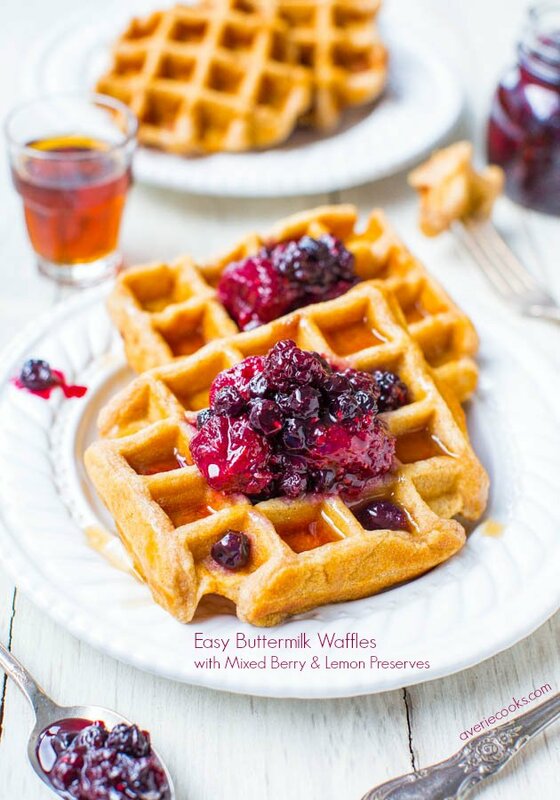 I especially love the pancakes with Vanilla Maple Syrup or Ginger Molasses Maple Syrup (linked below). Pumpkin pancakes are a perfect comfort food for chilly mornings when a cold smoothie doesn’t sound appealing. They’re definitely worth getting out of bed for. In a large mixing bowl, whisk to combine the first 9 dry ingredients (through optional salt); set aside. In a glass measuring cup or small bowl, whisk to combine all remaining wet ingredients (except maple syrup for serving). Pour wet mixture over dry, and stir gently until just combined; don’t overmix. Batter should be fairly thick; resist the urge to thin it out. However, if yours needs a splash of milk so that it’s a scoop-able consistency, or extra flour if it’s too thin, tweak as necessary. Tip – If cooking in batches (my skillet only comfortably holds 3 or 4 pancakes at a time), place cooked pancakes on a baking sheet and place in a preheated 200F oven to keep warm until while frying the remaining pancakes. 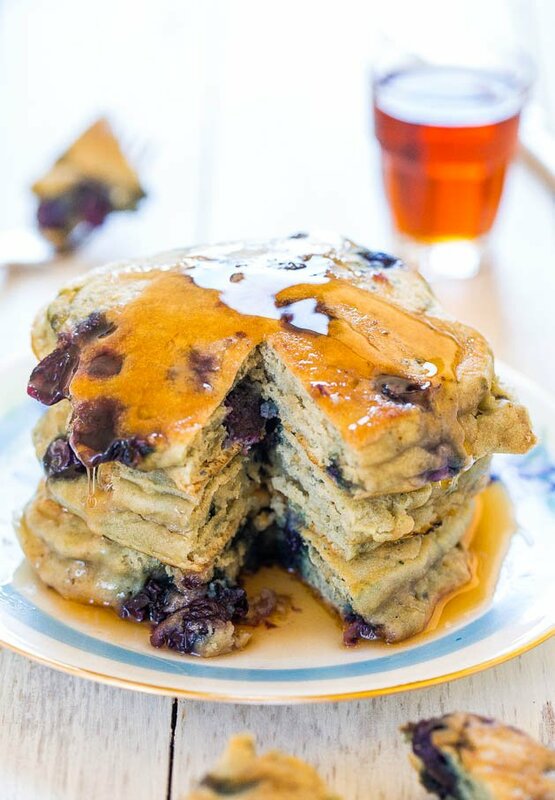 Pancakes are best warm and fresh, but will keep airtight in the refrigerator for up to 5 days or in the freezer for up to 6 months and can be gently reheated in the micro or toaster. 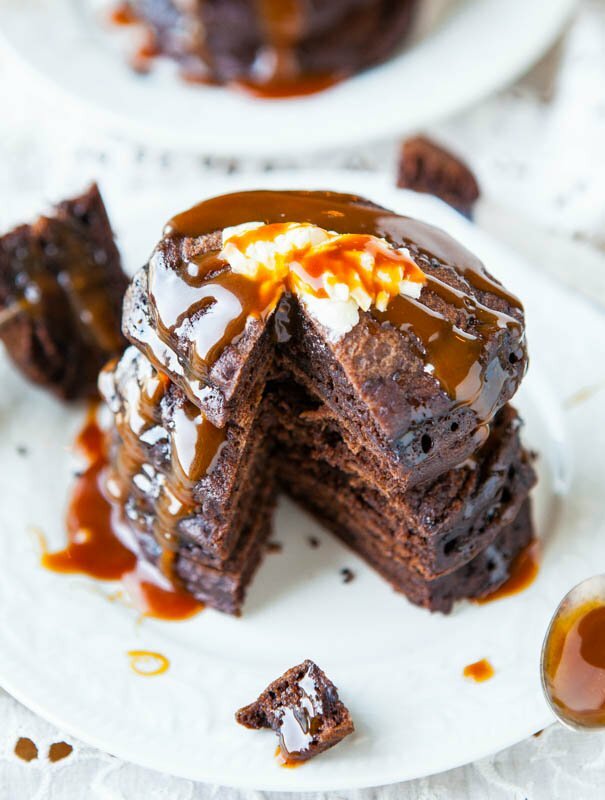 Serve with maple syrup or your favorite topping. 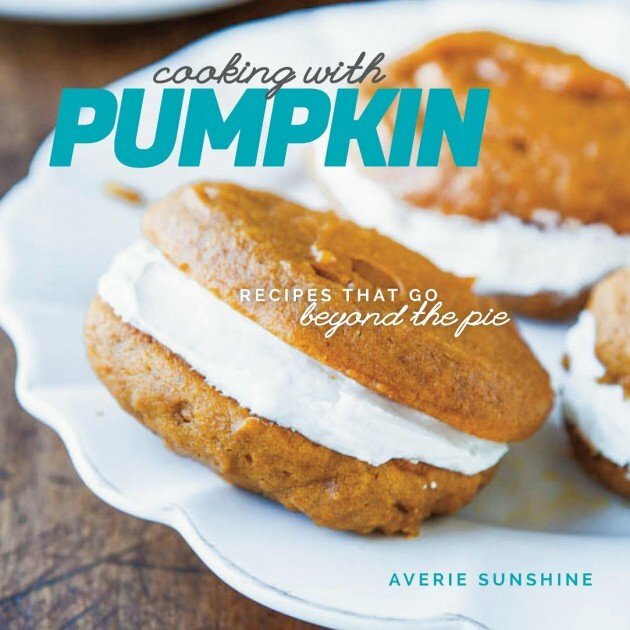 If you haven’t already pre-ordered it, Cooking With Pumpkin: Recipes That Go Beyond the Pie is my second cookbook and the official release date is October 6. Since you use almond milk, does the almond flavor come thru (not that I have a problem with almond flavor!)? And do you adjust the vanilla extract since you use the vanilla flavored milk? These do sound & sound wonderful! No I don’t taste the almond. And I really love vanilla and use it with wild abandon so it doesn’t matter if the milk is already ‘vanilla’, I always will add more vanilla to a recipe via vanilla extract. 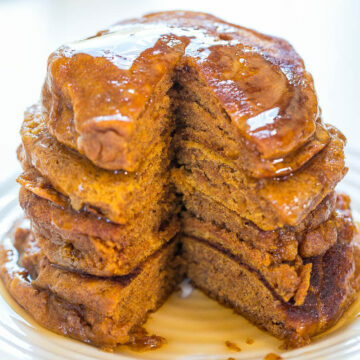 These pumpkin pancakes look so delicious, I love your pictures there always so beautiful! Pinned! Thanks for the compliments & pin! Yay! Let pumpkin season commence. I love everything pumpkin. I made these yesterday for an autumn breakfast. I have lots of pumpkins from my garden and I’m always looking for pumpkin recipes. These look spectacular! YUM*100!!! Just came across your website via Pinterest. Holy moly can’t believe I’ve been missing out on this. 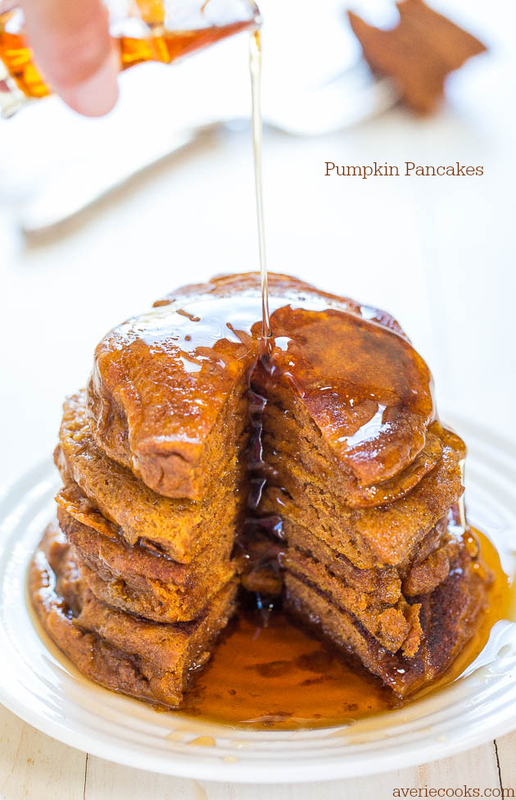 I’m trying these pumpkin pancakes ASAP. Thanks Averie! Thanks for finding me and if you try stuff, LMK! Thanks for ordering my book and for the compliments! And brinner is always a good cal! I made these tonight to freeze. I doubled the recipe, added a bit of extra cinnamon (I’m a cinnamon fiend), and subbed in flaxseed egg for the egg called for in the recipe. So. Delicious. Thank you for sharing! I’m a cinnamon fiend too and glad these came out great even with the flax egg! Thanks for LMK that worked well for you! 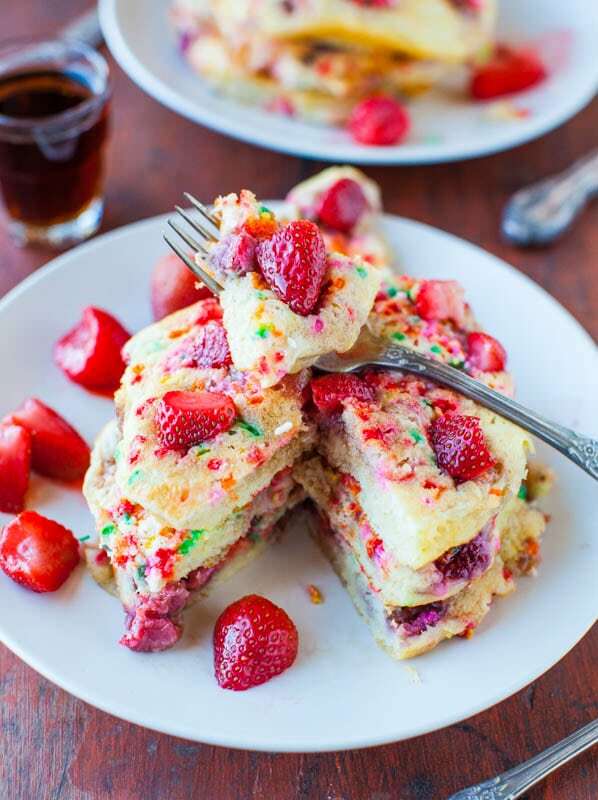 Just made these for the first time for my pancake-loving mother-in-law – they were fantastic! 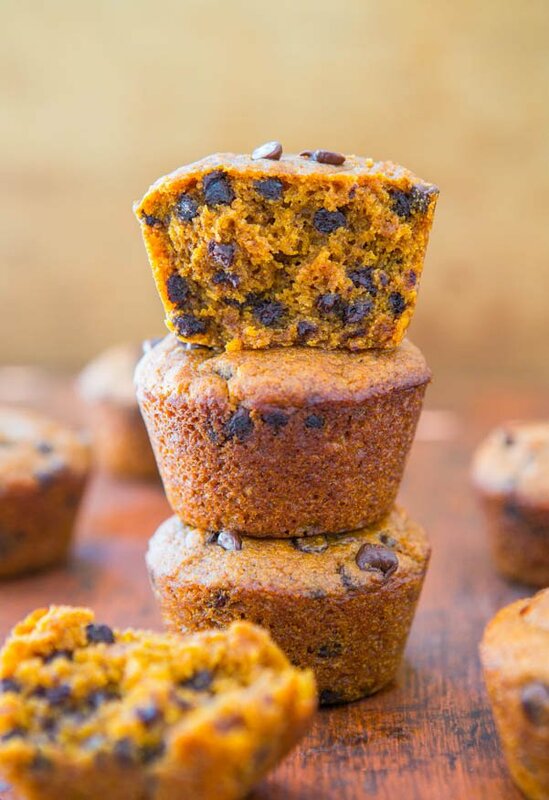 So soft and fluffy and just the right amount of pumpkin flavor and spice. We all loved them – I made a double batch so we’ll have leftovers to enjoy tomorrow. Great recipe, thanks! 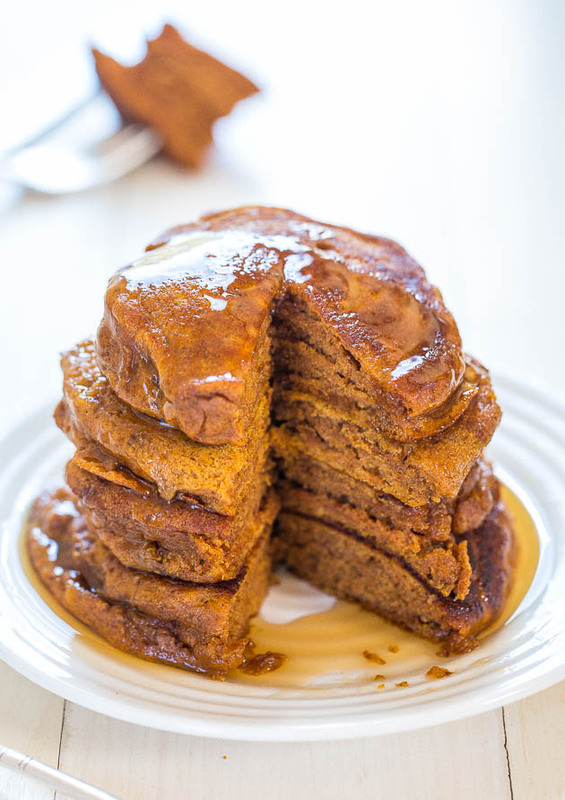 I love pumpkin pancakes and have tried numerous recipes… this is by far my favorite! I love the addition of the molasses! Thank you for another tasty recipe! 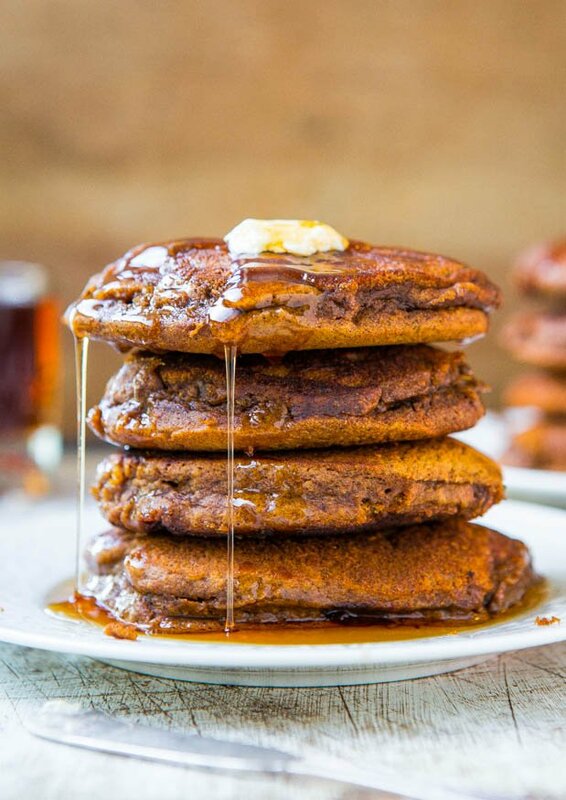 Glad these are your fave pumpkin pancakes you’ve tried! I agree…the molasses is great! It’s one of my fave ‘fall/winter’ flavors!